Diagnostic Centers are basically required for providing effective services to the medical profession or general public. It presents a truer picture of the nature of disease, status of penetration of the disease degree of cure and health of the cellular components of the body. 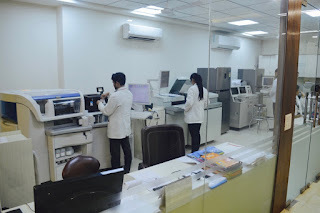 Our Lal Chandani Pathology Lab is one of the Best diagnostic center in greater kailash, South Delhi. They have been diagnosing the disease suffered by the patient, measuring the quantum of medicines to be provided, quantify the extent of cure effected since 1986. health checkup packages, Full body check up, senior citizen and women health checkups along with many more services like digital x-ray, blood tests, Ultrasound, ECG, etc. They have also founded CPC Blood Bank since 1987 in New Delhi. They have full time staff, quality manager with at least 25 years of experience. The lalchandani path labs chain consists of 5 self sufficient labs and 15 collection centers across Delhi/NCR. They are empanelled for all major panels such as CCHS, DJB, MCD, DDA etc with regular participation in External Quality Assurance Service (EQAS) along with prestigious institutes like AIIMS, Vellore & Sir Ganga Ram Hospital. Nowadays 80% medical treatment procedures have become highly dependent on diagnostic service to give measured, accurate and effective treatment. Our lab has evolved from visual and observation, tasting of body fluids, primitive testing with basic chemicals and heat to advanced atomic level measurement at present. Our services are approved by a qualified pathologist in India. Our lab is adequately equipped with latest equipment, technology with availability of modern automatic and semi automatic equipments which increase efficiency of output. • They are providing all routine and specialized biochemistry, Hormone assays, Drug assays, cancer markers, Torch Tests, Elisa T.B., Pap smear and Histopathology studies. • Maintain robust documentation, control checks and quality logs as per NABL. • Ability to process 1000 samples/hour with same day reporting. • Repudiated suppliers such as Johnson, Roche, and Nicholas Primal etc. • Reliability – Build trust among customers and make them feel confident. • Range of services – Single window solution, Picking and dropping, collecting sample etc. • Service Charges – Affordable charges. • Service Environment – Building, interior, colors, appearance of service provider, fragrance, cleanliness, hygiene, Noise level. • Attitude – Personalized attention, Care, Concern and courtesy, creates customer services. Their mission is to ensure that the right value is given in right time to the right patient means the test undergo everyday successfully. They set highest benchmarks in quality and expertise. Their network offers end to end solutions on the state of the art machines manned by skilled workforce. Great blog...I have learn more things about health checkups right here. Thanks for sharing good information. Keep update your blog. This post is realy nice, thanks.